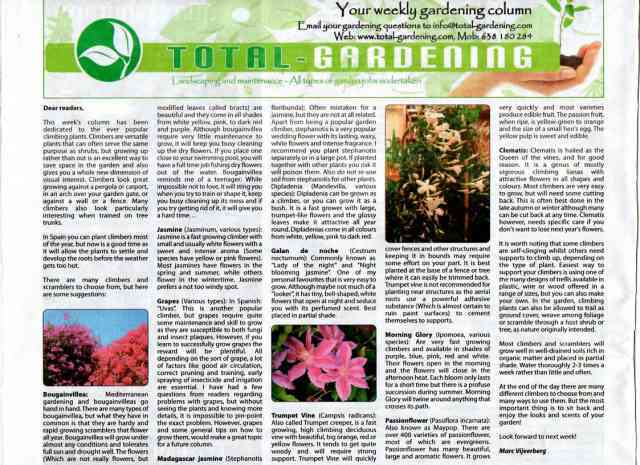 This week�s column has been dedicated to the ever popular climbing plants. Climbers are versatile plants that can often serve the same purpose as shrubs, but growing up rather than out is an excellent way to save space in the garden and also gives you a whole new dimension of visual interest. Climbers look great growing against a pergola or carport, in an arch over your garden gate, or against a wall or a fence. Many climbers also look particularly interesting when trained on tree trunks. 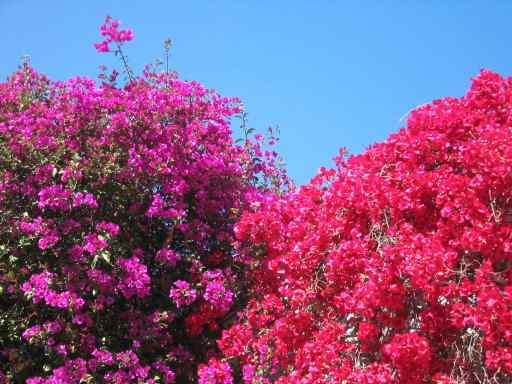 In Spain you can plant climbers most of the year, but now is a good time as it will allow the plants to settle and develop the roots before the weather gets too hot. Jasmine (Jasminum, various types): Jasmine is a fast growing climber with small and usually white flowers with a sweet and intense aroma (Some species have yellow or pink flowers). Most jasmines have flowers in the spring and summer, while others flower in the wintertime. Jasmine prefers a not too windy spot. Grapes (Various types): In Spanish: �Uvas�. This is another popular climber, but grapes require quite some maintenance and skill to grow as they are susceptible to both fungi and insect plaques. However, if you learn to successfully grow grapes the reward will be plentiful. All depending on the sort of grape, a lot of factors like good air circulation, correct pruning and training, early spraying of insecticide and irrigation are essential. I have had a few questions from readers regarding problems with grapes, but without seeing the plants and knowing more details, it is impossible to pin-point the exact problem. However, grapes and some general tips on how to grow them, would make a great topic for a future column. 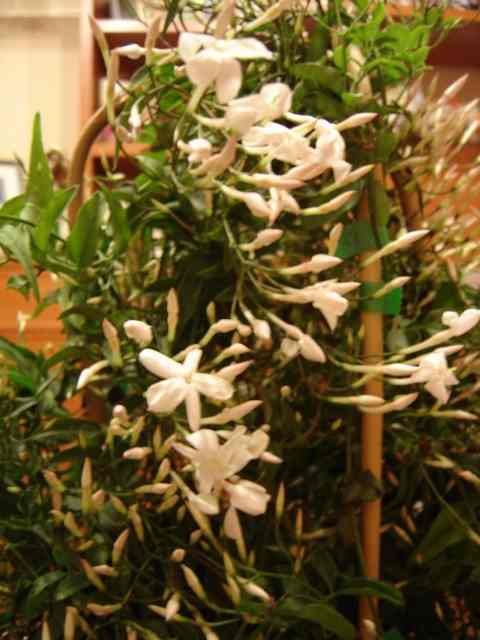 Madagascar jasmine (Stephanotis floribunda): Often mistaken for a jasmine, but they are not at all related. Apart from being a popular garden climber, stephanotis is a very popular wedding flower with its lasting, waxy, white flowers and intense fragrance. 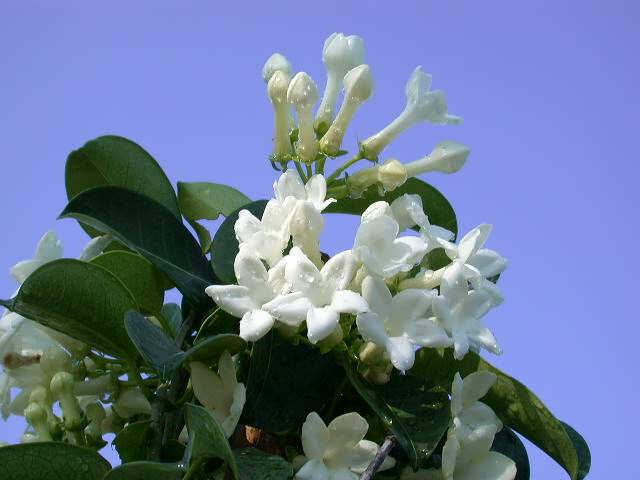 I recommend you plant stephanotis separately or in a large pot. If planted together with other plants you risk it will poison them. Also do not re-use soil from stephanotis for other plants. 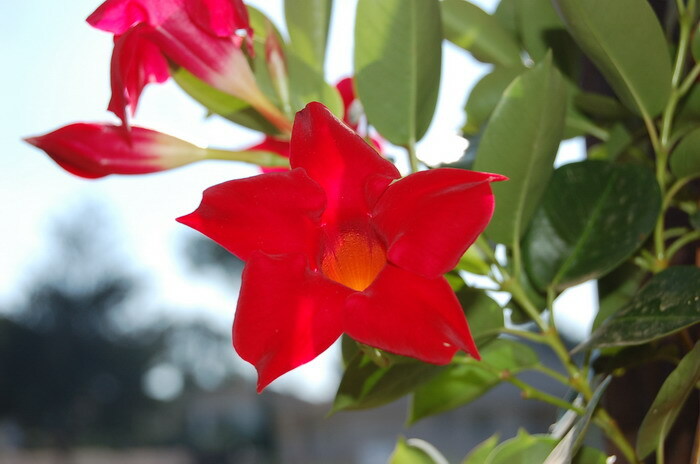 Dipladenia (Mandevilla, various species): Dipladenia can be grown as a climber, or you can grow it as a bush. It is a fast grower with large, trumpet-like flowers and the glossy leaves make it attractive all year round. Dipladenias come in all colours from white, yellow, pink to dark red. Galan de noche (Cestrum nocturnum): Commonly known as �Lady of the night� and �Night blooming jasmine�. One of my personal favourites that is very easy to grow. Although maybe not much of a �looker�, it has tiny, bell-shaped, white flowers that open at night and seduce you with its perfumed scent. Best placed in partial shade. 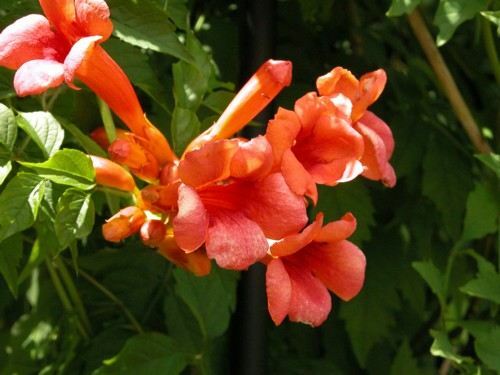 Trumpet Vine (Campsis radicans): Also called Trumpet creeper, is a fast growing, high climbing deciduous vine with beautiful, big orange, red or yellow flowers. It tends to get quite woody and will require strong support. Trumpet Vine will quickly cover fences and other structures and keeping it in bounds may require some effort on your part. 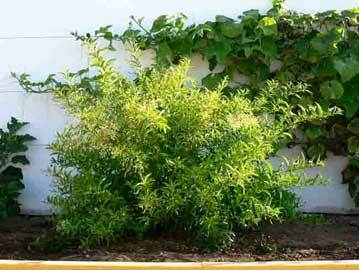 It is best planted at the base of a fence or tree where it can easily be trimmed back. Trumpet vine is not recommended for planting near structures as the aerial roots use a powerful adhesive substance (Which is almost certain to ruin paint surfaces) to cement themselves to supports. 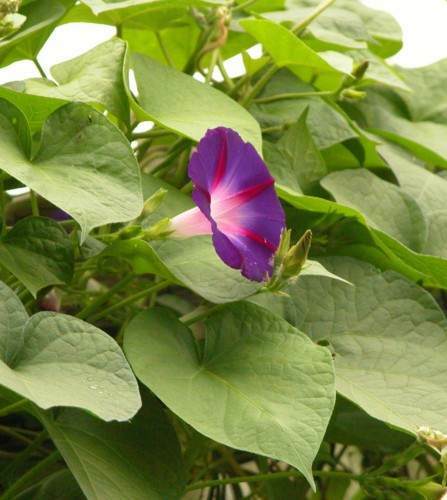 Morning Glory (Ipomoea, various species): Are very fast growing climbers and available in shades of purple, blue, pink, red and white. Their flowers open in the morning and the flowers will close in the afternoon heat. Each bloom only lasts for a short time but there is a profuse succession during summer. Morning Glory will twine around anything that crosses its path. 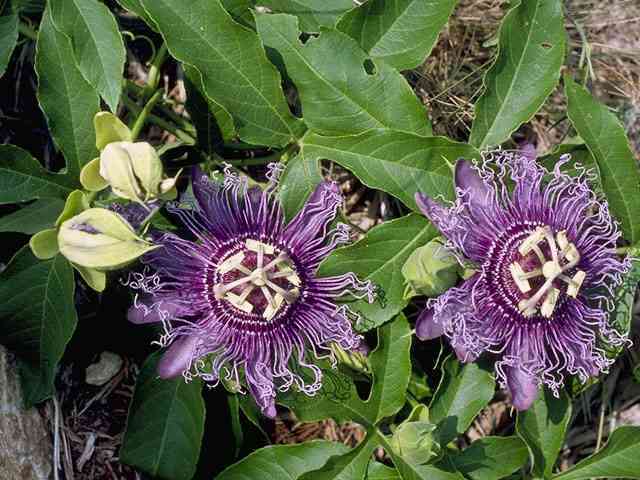 Passionflower (Passiflora incarnata): Also known as Maypop. There are over 400 varieties of passionflower, most of which are evergreens. Passionflower has many beautiful, large and aromatic flowers. It grows very quickly and most varieties produce edible fruit. The passion fruit, when ripe, is yellow-green to orange and the size of a small hen's egg. The yellow pulp is sweet and edible. 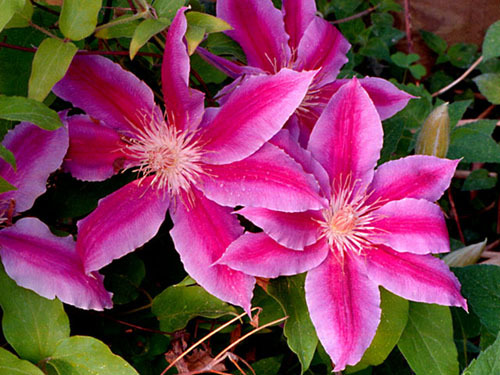 Clematis: Clematis is hailed as the Queen of the vines, and for good reason. It is a genus of mostly vigorous climbing lianas with attractive flowers in all shapes and colours. Most climbers are very easy to grow, but will need some cutting back. This is often best done in the late autumn or winter although many can be cut back at any time. Clematis however, needs specific care if you don't want to lose next year's flowers. It is worth noting that some climbers are self-clinging whilst others need supports to climb up, depending on the type of plant. Easiest way to support your climbers is using one of the many designs of trellis available in plastic, wire or wood offered in a range of sizes, but you can also make your own. In the garden, climbing plants can also be allowed to trail as ground cover, weave among foliage or scramble through a host shrub or tree, as nature originally intended. Most climbers and scramblers will grow well in well-drained soils rich in organic matter and placed in partial shade. Water thoroughly 2-3 times a week rather than little and often. At the end of the day there are many different climbers to choose from and many ways to use them. But the most important thing is to sit back and enjoy the looks and scents of your garden!